Trace: » Greenough, James C.
James C. Greenough was born in 1829, near the Amherst campus in Wendell, Massachusetts. 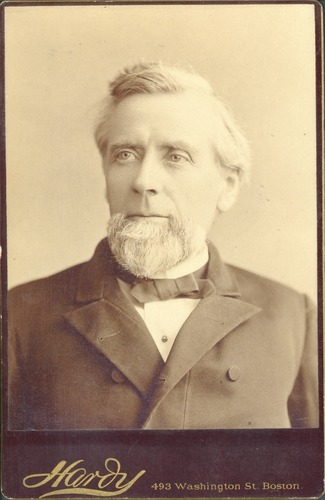 He worked as a schoolteacher in Heath, Massachusetts, from 1854 until returning to the State Normal School at Westfield in 1856 to become assistant principal. He left Westfield in 1871 to become principal of the Rhode Island Normal School, remaining at that post for 12 years. In 1883, Greenough came to the Massachusetts Agricultural College to become president, serving for three years. During his tenure, he was noted for raising academic standards, extending the course of study, and guiding a transition from a small vocational college to a more comprehensive institution supporting agriculture and extension services. Greenough saw the construction of the college chapel and the establishment of the Experiment Station before finishing his term in 1886.